All Occasions Cakes Glasgow | We specialise in Wedding Cakes, Birthday Cakes infact Cakes for all your special occasions throughout Lanarkshire and surrounding areas. to All Occasions Cakes, the home of beautiful handmade wedding cakes and novelty celebration cakes. No party is complete without a wonderful cake as the centrepiece – be it a Wedding, Birthday, Christening, Engagement, 1st birthday - 100th birthday, or even just a freshly baked cake for some self or family indulgence! 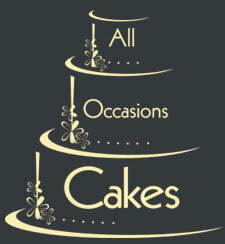 All Occasions Cakes can cater for your every need – we believe every cake should be perfect! Let us whip up some ideas and work our magic on the cake of your dreams! We offer a variety of designs but specialise in completely bespoke cakes that are made to order and delivered on time, every time. Please feel free to browse through our gallery for an example of some of the cakes we have designed…and if you aren’t drooling by the time you come to the end of the pictures, call us and we will tell you exactly what type of cake we would recommend for you and remember we can re create any cake you may see elsewhere!